This RDV model shows a planned expansion at Ben Gurion International Airport (BGN) in Tel Aviv – courtesy Israel Airports Authority. Limited runway capacity and noise concerns at the airport prompted the airport authority to re-design its runway system. One major step required to alleviate the capacity would be to lengthen one of the runways, allowing it to be used North-South as the main approach runway. Expansion was limited by available land adjacent to the airport, and creation of the new taxiways created a particularly complex airfield configuration. 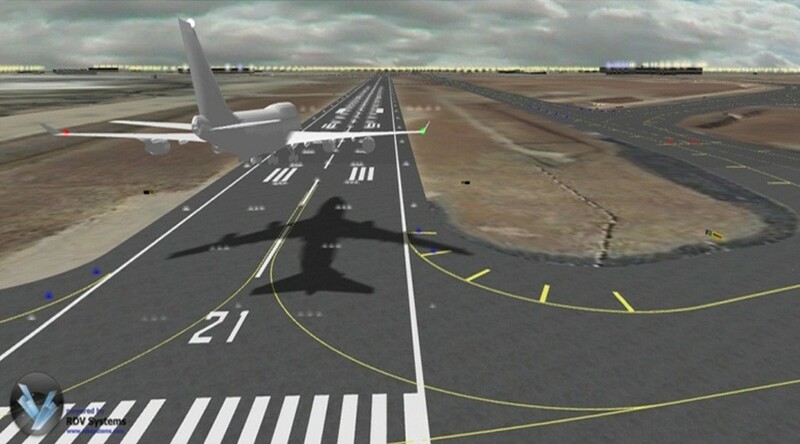 The RDV model allowed the planning team to simulate and test the planned configuration on pilots and controllers to measure how they dealt with the increased complexity. Improvements could then be made and retested. The visualization model simulated turning lights on and off to reflect the proposed configuration and an interface was developed based on the actual electrical plans, simulating each of the electrical circuits involved in the system. Controllers and pilots made run-throughs of the simulation with several different aircraft types, using different approaches and runway exits, and in diverse weather and visual conditions to understand how the planned system would perform from their perspective.